From September 22th - October 22th 2017 Wobby.club presented the project The Half Truth at Graphic Matters in Breda. 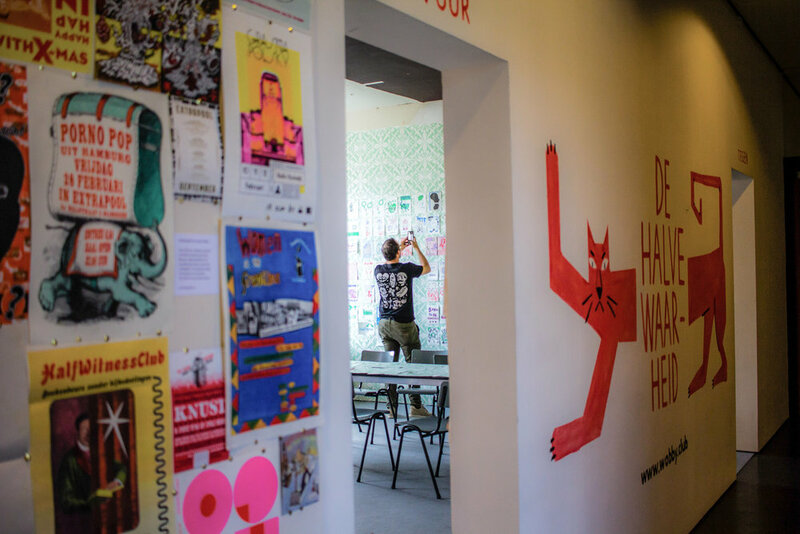 The expo started with a selection of Risograph printed posters and flyers from the archives of Knust Press Nijmegen. A series of A2 Risoprinted posters were made by six duos of artist and writers and exhibited at the Half Truth project space. Every weekend Wobby.club was present at Graphic Matters and pamphlets were printed on-site. Under the expert guidance of Wobby.club the public could print pamphlets with a Risograph (stencil) printer. On October 1st Wobby.club hosted Radio WobTit, a live radio show with interviews with a.o. artists and writers Jeroen de Leijer, Mat Wijn, A.H.J. Dautzenberg, Nick J Swarth, Bobbi Oskam, Jip Piet, Sanne Boekel, Christiaan Weijts, Maia Matches, Micha Wertheim and Eefje Wentelteefje.